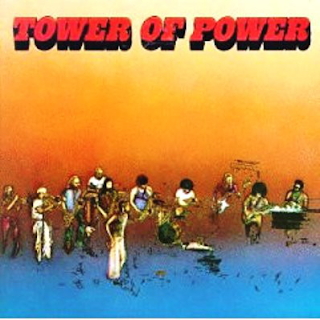 This was Tower Of Power's third album and they underwent a few line up changes - Skip Mesquite left and was replaced by Lenny Pickett on saxophone. He sessioned for Elton, The Meters and the Brothers Johnson among others as well. The excellent, honey-voiced Lenny Williams was brought in to give them permanent lead vocalist. It was awarded a gold record for sales and is one of their most rounded, confident, fulfilled offerings. 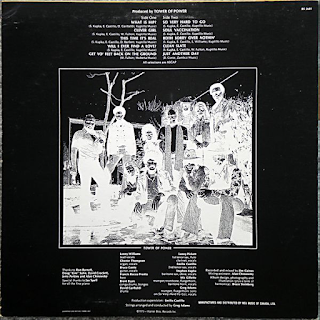 The band had thirteen musicians playing on this album and you can tell. It is musically most impressive. The opener, "What Is Hip?" is a superb slice of Meters-style funk, with the band's punchy horn section at its best. "Clever Girl" is a laid-back, smooth piece of soul, while the jaunty, upbeat "This Time It's Real" has Northern Soul written all over it. "Will I Ever Find A Love" is an orchestrated, slow soul ballad, with sweeping strings and a confident, soulful vocal. Just when you thought they had deserted the fun, it was back, big time, with the seriously cookin' "Get Yo' Feet Back On The Ground". However good the soul stuff is, it is on these down 'n' dirty workouts that you get the best of Tower Of Power, in my opinion. Just check out those irresistible funky rhythms, the drum, bass and organ interplay. Marvellous. Stuff like this was actually quite ahead of its time, although having said that, The Meters had been putting out seriously good funk since the late sixties. "So Very Hard To Go" was actually a hit single too, which was unusual. It has a Temptations feel to it, and a wonderful horn refrain. Memphis-style Stax-y guitars drive it along too. "Soul Vaccination" is so deliciously funky it is making me hungry. It cooks to the nth degree. Those lilting, funky guitars are thoroughly addictive, as is the drum rhythm. It doesn't get much better than this, as for the saxophone break - wow. That is not even mentioning the beauty of the bass solo half way through. Musicianship of the highest quality, a band totally in tune with each other. 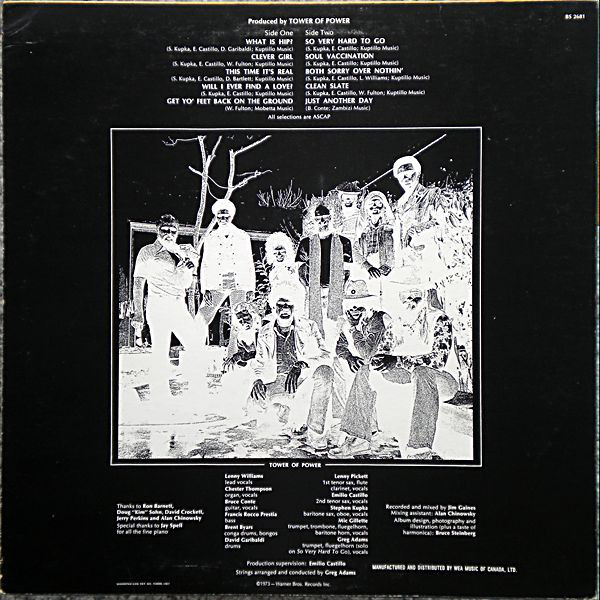 "Both Sorry Over Nothin'" is pure Otis Redding soul, with added funk too. I know this was Tower Of Power's most successful album, but why they weren't huge is a mystery to me. There is some seriously great material on this album. The soul/funk brilliance continues on the impressive "Clean Slate". The album closes with return to late-night soul with the beautiful "Just Another Day". If you like seventies funk and soul, you can't go for wrong with this. The sound quality, as on all Tower Of Power's albums, is excellent as well.